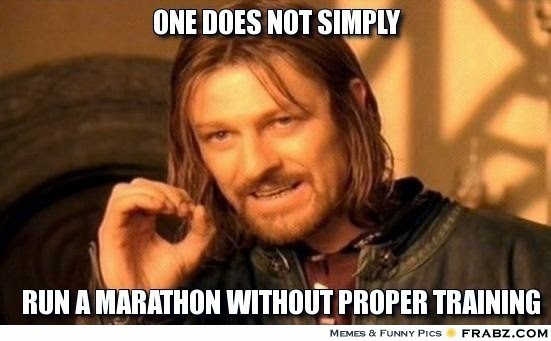 It's hard to believe that the marathon is only 4 weeks away. While I've been hearing from others who are training that they are feeling burnt out, I haven't felt that way. This time around, I've had fun with my training, even though some of the CrossFit stuff has been really hard, even nausea inducing at times. I am starting feel some aches and pains though, as the training is taking its' toll on me. My left big toe, my nemesis, is yakking at me a little more than usual. Friday I woke up with a very painful R foot--I had trouble walking on it. Luckily, a little ibuprofen was all needed to put that at rest. 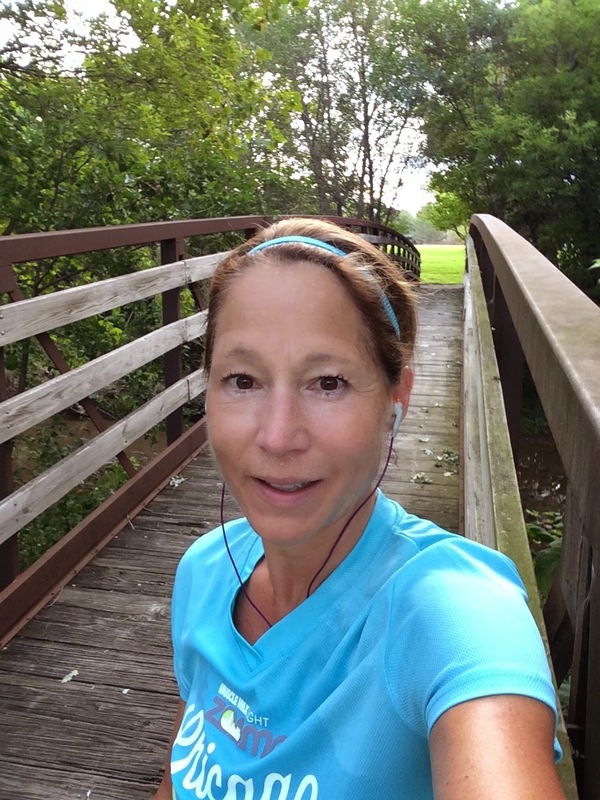 Yesterday, my R hip twinged a little during my 6 miler. This morning on my 10 miler, my R knee was kind of achy. I'm going to really work harder on stretching and foam rolling as I move into the final 4 weeks now. Monday: This is the last session of CF intervals! I have mixed feelings about that--as hard as they have been, I think these intervals have been the key to my strong running throughout this training. Today I did dumbbell burpees with box step-ups x5, CF sit-ups x5, wall ball squats x5, followed by 100m all out on the rower. I did three rounds of this. Becky told me I had to beat 27 seconds on my last 100m of rowing or else there would be a consequence--which I am sure would have been burpees. I completed that 100m in 24.7 seconds. So there. Nothing better than negative incentives! When I got home, I finished up with that SeaWheeze yoga video that I love. Hits all the high points. Tuesday: 8 miles before work. I got the boys fed and lunches made before I headed out to run. The morning was cool and clear, and my pacing was good. I finished strong with an average 9.03 mins/mile. I headed off to work with a smile on my face. Wednesday: It was a really rainy, yucky day, and I was glad it was yoga Wednesday. I had to go into work early, and so in lieu of my studio class, I did that Eoin Finn The Pursuit of Happy Hips video. There are several in the series, and I did the Easy Street one, wanting just to really stretch out my hips. They (and I were happy). 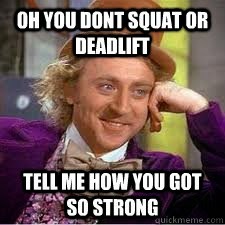 Oh, yes, I did back squats too. This was a little weird...Becky put kettlebells hanging from elastic bands on the bar. I did one set of 5 with 10# kettlebells. Then she switched to 20# kettlebells and had me do 5 sets of 5 reps. I had to really focus on form because the bar was hard to keep steady. But she told me I was really "stable" the whole time. Yay! Friday was rest day for me. Work was crazy and by the end of the day I was exhausted. I'm sure it was a combination of the hard workout from Thursday and the mental workout I got from work! Saturday: 6 miles. I decided to just run, no plan. It was cold-43F- and cloudy, and I was still feeling a little tired. 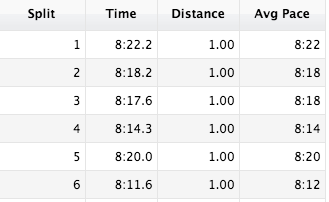 So I tried not to focus too much on pace, but I still was pretty consistent, with an average of 8:50 mins/mile. Sunday: 10 miler. Last night my husband and I went out with 4 couples for drinks and "snacks". I wasn't thrilled about the "snacks" part, because, after all I had a 10 miler on tap for this morning and I didn't want to pay the price for bad eating. We ended up at the Hofbrau House for Oktoberfest--which was not a choice that made me happy. Don't these people know I'm training for a marathon?! (Joking.) I reviewed the menu: sausage, weiner schnitzel, pretzels--seriously, the men ordered something called the weiner tower! Yes, it was a tiered plate full of weiners. Because we were getting "snacks", I ordered an appetizer of pretzel breaded cheddar cheese balls. Really, the lesser of all the evils on the menu. As it turned out, there was a side of German coleslaw (made with a vinagrette-yay!) and no one wanted to share my cheese balls, so I ate everything and felt a little better. It was almost a meal. I had a Weiss beer and then switched to water. I took a pass on the shots of German liquor that came with a side of paddling by the waitress. I kid you not! We got home late and I thought I'd pass out, I was so tired but my husband, who had more than his share of beer, was snoring loudly all night. Sigh. When I finally got up this morning, about 7, I was exhausted and I thought that there was NO WAY this run was going to go well. 2 cups of coffee and a bowl of cheerios later, I felt renewed and headed out the door, a water bottle with Tailwind nutrition in hand. 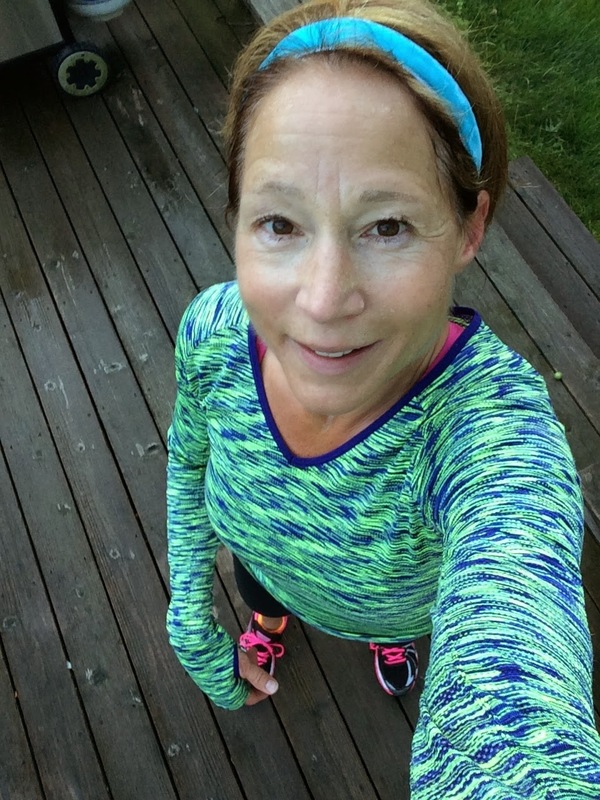 I started slow, at marathon pace and my legs felt loose and light. I moved down the path at a nice comfortable pace, enjoying the cool temps and the bright sunshine. I stopped a few times to take a few big sips of the Tailwind, making sure to drink about half the bottle by mile 5. I turned around to head home and still felt good. My legs flew and I picked up the pace. I finished 10.43 miles in 1:35:29; average pace 9:09 per mile. Wow! Was it just a good day? The weather? The Tailwind nutrition? The cheese balls? The juju from the smiling tree? It's a link to his website...I downloaded the whole series. He's a little corny, but the workouts are amazing! Another excellent week! Glad you like the Tailwind. So far yes! We'll see how the Tailwind works on my 18 miler this week. 4 weeks...almost home stretch!! I think I need this hip video too! My hips always get wacky during marathon training. So far, the trail running has helped a lot with my hip issues...I think the change of terrain and foot landing has been a good thing. The hip video is a good one! You are on fire! I'm so glad that you are not feeling burnt out yet during your training. That's awesome to hear - especially after reading all the you accomplish in workouts each week! You totally got this! Another great week of training for you! You had me scared with the cheese balls, LOL...dairy and I are NOT friends, especially before a long run! LOL!! I don't have a problem with dairy, thankfully. I don't know what I'd eat if I did--so many other foods bother me! It had to have been the cheese balls, Wendy...HA! :) Love it! I always cringe when I find myself in these situations; sounds like you did a great job of making the best of it, though, and way to go on your week of training - woo hoo!!! I'm so excited for you! It had to be the cheese balls. haha! Can you imagine if it was?? ?